Spring Fever? 10 simple DIY ideas to freshen your home. Now that it's spring, and really it feels more like summer in Saskatoon at this point, you may be in the mood to freshen up your home and try something new. But you don't want to invest a lot of time or a lot of money to make it happen. Remodelling magazine's annual Cost vs. Value report tells you which home improvements deliver the best payoff when it comes to resale value. But before you think about the next owner, what about enjoying life in the home you have now? The good news is there are lots of small, less expensive projects that can help you get the most enjoyment value out of your home. Homeowners often make two major mistakes when they redecorate, and one is remodelling for resale, rather than for themselves. And when homeowners do remodel or renovate, they tend to do it with guests in mind. It's great when all the family comes home and is in the house, but it's not great for how they live the majority of the time. Paint. Not only do brushes and quality paint matter, but so does technique. Preparation is over half the job with taping, covering, and proper set up of paint and brushes. Change your cabinet hardware. You can do this in the kitchen, in the bathroom and on furniture pieces such as dresses and built-ins. You can really have fun with this one and find unique options. Etsy is a great website for finding one of a kind hardware. The job is usually simple and requires only a screwdriver. Update your kitchen. Many steps short of a full kitchen renovation can still make a big difference. Consider painting old cabinets or adding new doors. You can also change or update your countertop. Install new lighting or plumbing fixtures. New faucets and light fixtures can significantly modernize a room, but smaller changes make a difference, too. If you have a chandelier that you like or you can't change the one you have, switch the candle-shaped bulbs for round ones. You can also change the lampshade or cover an old one using hot glue and a fabric remnant. Refresh your bathroom. A new shower curtain, towels and rugs instantly freshen a bathroom. You can also take other steps short of a gut remodel, such as changing the vanity or refacing the bathtub. A new bold mirror can really add a feature point to your bathroom if you wish to draw attention away from an older shower. 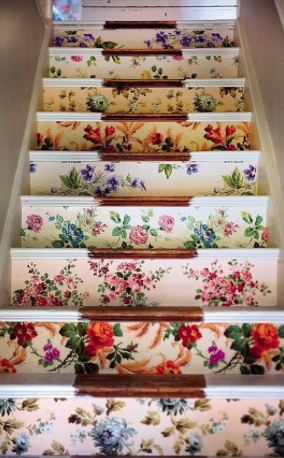 Redo your entryway. Changing your front door is relatively easy, immediately changes the look of your home, and can add resale value to your home. If you can't replace your front door, you can paint it. Consider changing the light fixture, replacing the mailbox and installing new house numbers. If the space is right, add some potted plants as well. Improve your outdoor space. Options include adding a patio or deck or sprucing up the one you already have with a new stain. Adding low-voltage lighting is another easy project, plus you can add landscaping. There is an amazing company in Saskatoon called Wild Flower who can help you come up with layout ideas and information on native plants. Change your window coverings, throw pillows and other accent pieces. These days, less is more when it comes to window coverings. If your larger furniture pieces are neutral colours, you can add splashes of a new colour with pillows and other accents. 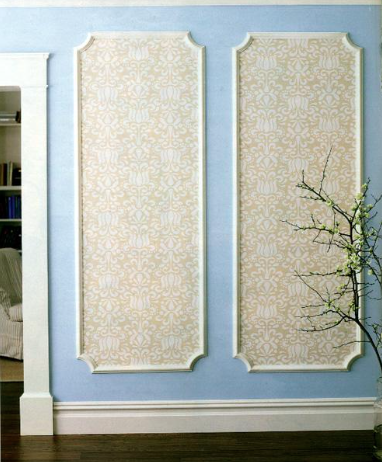 Wallpaper an accent wall or inside a bookcase. Wallpapering an accent wall is a great way to go bold with pattern. You can also paint the accent wall. Get rid of excess furniture and clutter. We often think of projects that add storage space, and there are many creative ways to do that. But first take a hard look at what you're planning to store and see if you really need it. Removing half the furniture from a room and clearing off surfaces can give the room a new, clean look at no cost. Keep in mind that some projects you can do yourself and others are best left to professionals and contractors. You may think you have an idea how to change your faucets, but with something that can cause problems down the road it's best to hire an expert. If you're going to do a project yourself, make sure you have the right tools. An electric screwdriver, for example, makes an enormous difference if you're assembling any furniture yourself. Some projects require a hot glue gun, and others might benefit from an electric drill or electric sander. If you don't want to buy tools, check out rental options. Do the math on each tool. Are you going to use it once or once a year? If so, buying secondhand could be a good idea. Projects that improve your kitchen and bathrooms are often worth doing. We spend a lot of time in these rooms, and that's where you can see and enjoy where your money was spent. And small projects can make a big change. Changing a light fixture in the dining room or the bedroom can really update the whole look of the room. If you combine this with new window treatments it can look like a whole new room. Paint is probably the top change that delivers a new look. It's important to use the right paint and the right way. If you put latex paint over oil paint, for example, it won't stay long. Good brushes and rollers also make a big difference. Take your time taping your project off first and it will save you a lot touch ups in the end. Ideas are easy to track down, as decorating and renovation projects are everywhere. Some of the more popular sites are Pinterest, Houzz and HGTV. Just be warned, 10 min becomes 2 hrs in the blink of an eye! If you're looking for step-by-step instructions, you can probably find a video on YouTube or elsewhere. Just type your project into a search engine, and you have everything you need. But do be thorough with your research first and don't hesitate to contact a professional like us here at Alchemy Renovations when you're in doubt. You may also find some useful apps. Likes the one that turns your iPhone into an instant level. You can also find apps that help you design or lay out a room, as well as apps from Pinterest, Houzz and similar sites.